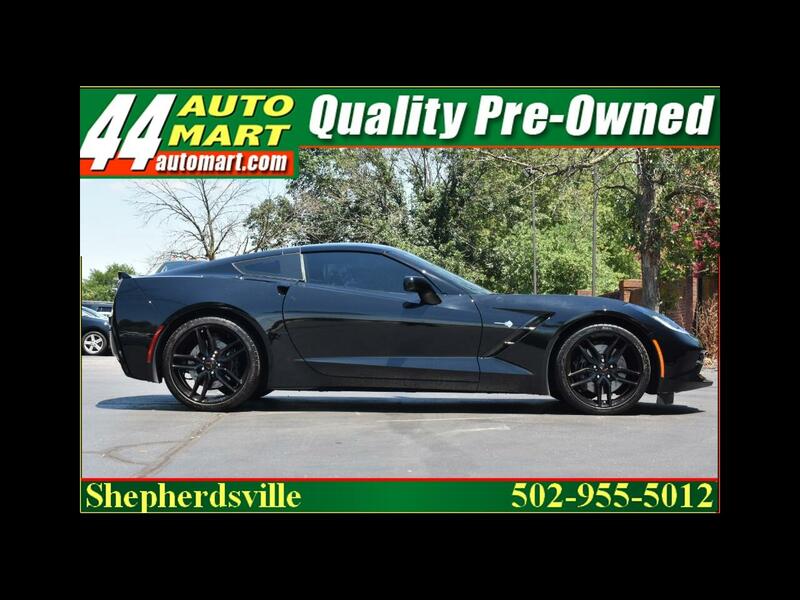 We are the #1 pre-owned Corvette dealer in Kentucky!!! Built in Kentucky, sold in Kentucky. New Corvette inventory arriving daily. $75,455 MSRP! WHY BUY NEW? Z51 PACKAGE $5000, 8-SPEED AUTOMATIC TRANSMISSION $1725, 3LT PACKAGE $9745, BLACK PAINTED ALUMINUM WHEELS $495, TRANSPARENT ROOF $995, AND LOTS MORE! 460 HORSEPOWER 6.2 V8 ROCKETS FROM 0-60 IN 3.7 SECONDS!! WHY BUY NEW? THIS STINGRAY LOOKS, RUNS, AND DRIVES LIKE NEW FOR WAY LESS. We are a family owned and operated dealership who has been in business since 1988. We currently have over 400 quality pre-owned vehicles in stock. If we don't have it, we will locate it for you. See our inventory disclaimer at 44automart.com. Call (502)239-4481 for more details. 44 Auto Mart is currently serving ELIZABETHTOWN, LEITCHFIELD, HARDINSBURG, BROWNSVILLE, MUNFORDVILLE, HODGENVILLE, CAMPBELLSVILLE, LOUISVILLE, CLARKSVILLE, JEFFERSONVILLE, NEW ALBANY, BARDSTOWN, SPRINGFIELD, LEXINGTON, PADUCAH, BOWLING GREEN, FRANKFURT, ASHLAND, WINCHESTER, VERSAILLES, TAYLORSVILLE, SHELBYVILLE, FORT KNOX, LAGRANGE, RADCLIFF, BULLITT COUNTY, JEFFERSON COUNTY. HARDIN COUNTY, NELSON COUNTY, LARUE COUNTY, GRAYSON COUNTY, MEADE COUNTY, WASHINGTON COUNTY, MARION COUNTY, OLDHAM COUNTY, FAYETTE COUNTY, ADAIR COUNTY, BOYD COUNTY, GREEN COUNTY, AND MORE! WE CAN FIND FORD, LINCOLN, CHEVROLET, CORVETTE, GMC, CADILLAC, BUICK, DODGE, RAM, CHRYSLER, JEEP, CUMMINS, DURAMAX, POWERSTROKE, TOYOTA, SCION, SMARTCAR, LEXUS, NISSAN, INFINITI, MAZDA, SUBARU, HONDA, ACURA, KIA, HYUNDAI, GENESIS, MERCEDES, BMW, VOLKSWAGEN, AUDI, JAGUAR, RANGE ROVER, TESLA, MASERATI, and more! WE SPECIALIZE IN LIFTED TRUCKS, DIESELS, SPORTS CARS, SUVS, SEDANS, HATCHBACKS, HOT HATCHES, AMERICAN MUSCLE CARS, RVS, TRAVEL TRAILERS, MOTORHOMES, COUPES, CONVERTIBLES, OFF ROAD VEHICLES, MOTORCYCLES, ATVS, BOATS. Message: Thought you might be interested in this 2016 Chevrolet Corvette Stingray.